Chosen Kett Enemy Profile, Quests Stats and Strategies [Mass Effect Andromeda] - SAMURAI GAMERS: Mass Effect Andromeda Hints, Tips, Tricks and More! 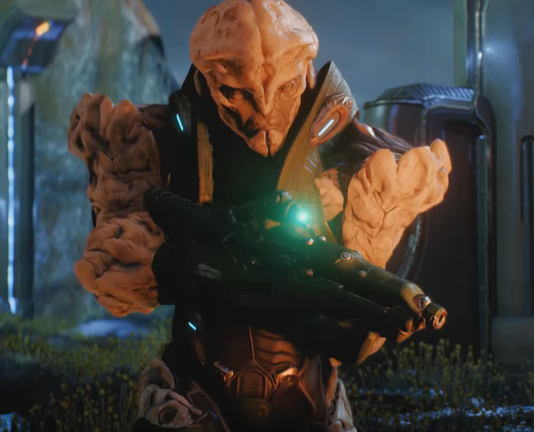 This is a Mass Effect Andromeda enemies article on the Kett Chosen. Here you’ll find information about an enemy found in Mass Effect Andromeda. Pictured: the Archon with some infantry. The footsoldiers of the Archon, the Chosen are cannon fodder for Ryder and his team. Chosen are the front-line soldiers of the kett, encountered on multiple worlds as support for other Kett combatants. They are equipped with assault rifles that fire plasma-surrounded projectiles, and light armor that allows them to move and deploy rapidly. Though their biology is still under investigation, they are capable of surviving in hazardous environments without protective gear. The name “Chosen” was intercepted and tentatively translated from kett communications. if accurate, its significance is unclear, since these are clearly the kett’s baseline infantry. Pictured: using the cryo beam on this enemy. Kett chosen are not hard to kill. You have a myriad of strategies on how to take them out. An almost instant way to kill them is to freeze them with cryo beam and melee them once they’ve turned into ice. Another way is to inflict burning damage with either incinerate or flamethrower, which burns them to death quite quickly.